Enjoy an outdoor adventure- from the comfort of your own sewing room! 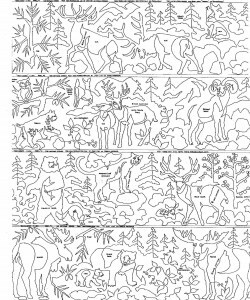 Relive your favorite memories of the great outdoors as you stitch up your next quilt using one of MeadowLyon’s woodland designs! Now in an easy to use 12″x 12″ book format, featuring 12 full size stitching medallions and Lewis and Clark Trails Quilt instructions. Special introductory price of $19 (regular price $22) This May marks the 211th anniversary of the “Corps of Discovery” Expedition. 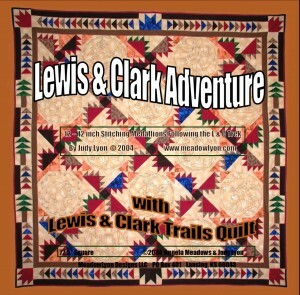 Celebrate by following along the Lewis and Clark Trail with these patterns! Click here to get a free PDF copy of Sacagawea. 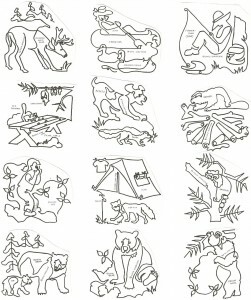 MeadowLyon Pictograms pack tons of story into your stitching! Get used to hearing “I didn’t even notice that before!” and seeing their smiles every time they find something new in your quilt. I love this pattern! Doesn’t it spark memories of our favorite camping disasters? Sister is moments away from getting sprayed by a skunk, bears have helped themselves to the food (hung from the tree to keep them safe of course), Mom is going to get quite a surprise as she rows right up to a swimming moose, Dad is inches away from a bee sting, snakes slither and poison ivy abounds! 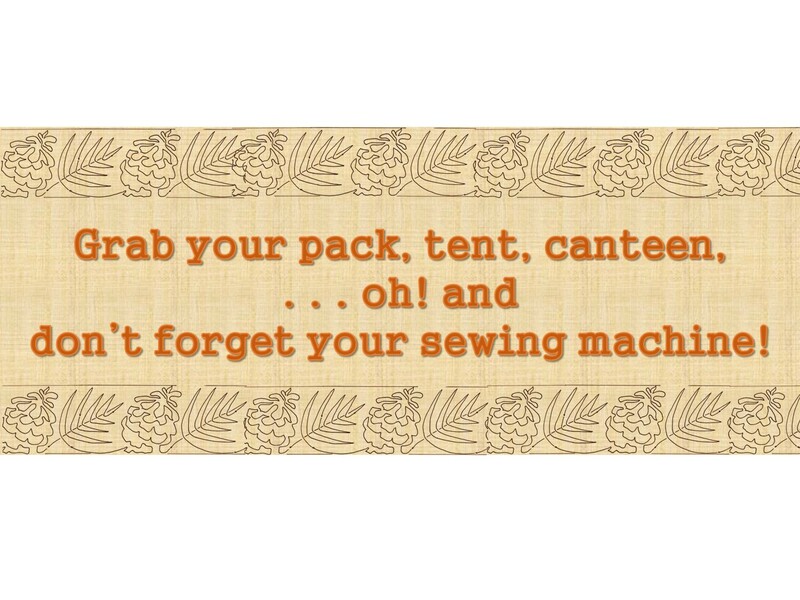 Does this sound like any of your camping trips? My family just took an overnight camping trip to Roman Nose State Park in Oklahoma. We are definitely not experts! (Confession: we always watch a movie on a tablet in our tent at night.) This time, our near disaster was having a cooler full of food, four hungry kids and then realizing at dinner time that the firewood we brought had the words “not for cooking” on the bag! Luckily, Dad, our hero, saved the day by hunting down some wood from a farm nearby (what happened to the days when the woods were actually filled with wood you could use?) We were happily chomping on s’mores by dusk. What kind of camping disasters have you had? I would love to read about them! Tell your story in the comments section below! 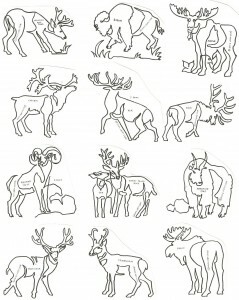 Each animal and plant in this pictogram has been realistically and accurately depicted in this beautiful nature scene. 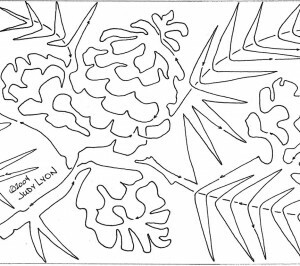 It is such a lovely work of art that it is shocking to remember it is all made from one continuous line! This popular pattern is a favorite among outdoorsmen (and women). I love the fern rich undergrowth of the Northern Pacific Forests. Maybe I expect a leprechaun or two. What I know I will find is pine scented scenery filled with salmon, bears, eagles, elk, wolves, foxes and even owls. What’s that? Do I hear a woodpecker knocking at that tree? There are even some Totem poles nestled in the forests. 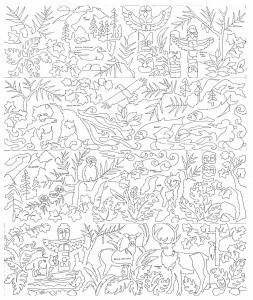 If you love the Northwest, you’ll love this pattern. Birchbark looks amazing quilted out and it hardly matters if you make a mistake, because it’s all wriggly anyway. 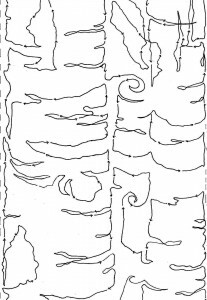 It can be used as a Border or a vertical E2E. It comes with a 3” border of Canoes – birchbark of course. This is a perfect companion to the Pacific Northwest Pictogram. 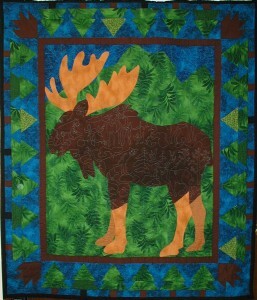 The right borders and sashings really customize the look of your quilt. 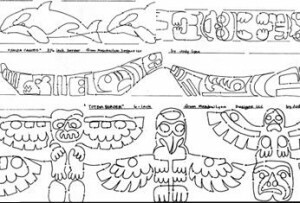 This set includes totem borders, totem sashings, Haida canoes, and an orca border. 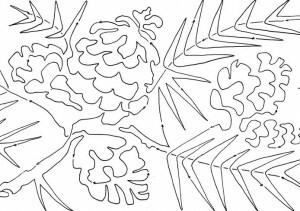 Riverflow is a really easy pantograph for the quilts that need to be finished up in a hurry. Of course, it needs to be interesting to pass my test. I think this one does and I know it will become one of your “go to” patterns for a variety of projects! 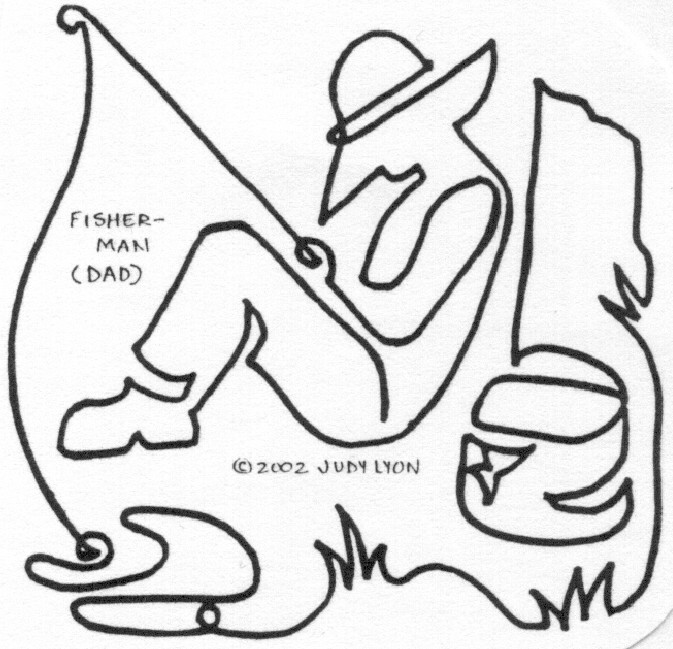 Did your Dad take the family on fishing trips when you were a kid? Being from Minnesota, my Dad was a big fan of boating and fishing. Truthfully, there’s no better way to eat fresh fish than cooked over a campfire! I remember one spring our family went to the Ozarks. We camped alongside a beautiful stream that was as clear as glass. It was a delight to walk out over the smooth stones and look straight down to the bottom. I hope you’ve had an experience like that too. If you haven’t, try an Ozark vacation! Ponderosa Pine Spray 9″ is one of our most popular patterns. Whether you’re the out-doorsy type or filled with holiday thoughts, or recalling great family vacations, Pine boughs just about have to be part of the picture. 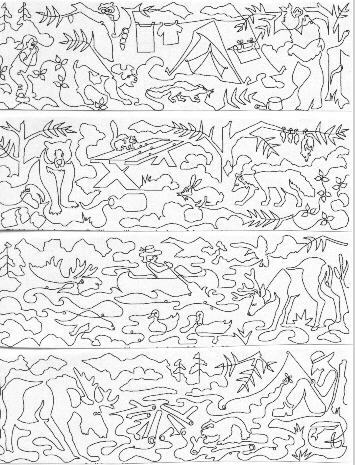 You’ll find lots of uses for this pattern. Here is a fast and quick covering version of our most popular pattern. I may have used this little pattern more than any other. A sprinkling of pine goes so well with so many other patterns! Owls are so popular right now. The little ones are cute bits of fluff. Our baby grandson’s carseat is newly covered with the cute little birds and so are fabrics and decorator items galore. 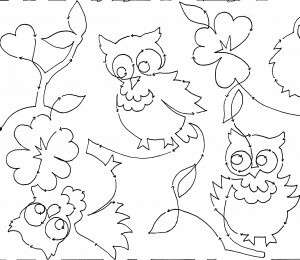 Everyone just has to have owls! 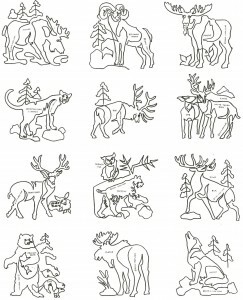 You’ll have lots of fun with these 2 great images of Santa! This unique dual pattern gives you lots of variety and fun. 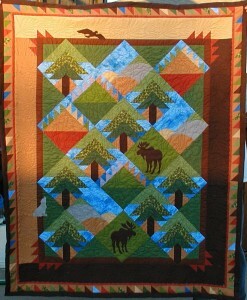 Let them spin around the border of a special, woodsy Christmas quilt. I love the rustic backwoods look for the holidays. Don’t you wish you could stay in the woods for Christmas? Sheltered in a cozy cabin with a roaring fire, while being “snowed in” high in the Sierras or the Alleghenys, has always been a romantic dream of mine. We have a limited supply of these printed block pattern sets left. 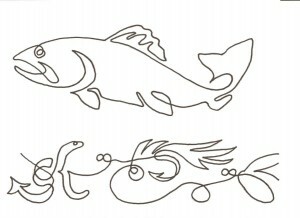 However, after they are gone you will still be able to purchase these patterns as PDF’s. Finally, no campout would be complete without bug bites and swamp critters! Pick up as many as you want for free!